All geothermal energy that enters the oceans through the ocean floor warms the cold bottom water. This energy has to travel up either by convection or conduction. Around 1000 m. it will reach a progressively warmer layer, that makes it impossible to reach the surface, except at the arrows, where the temperature is ~30 C. So all geothermal energy that enters the deep oceans can only escape at a small portion of the total surface area. To demonstrate the effect of the geothermal energy entering the oceans I’ll create two continents at 40N and 40S in Fig 3. The same cross section as used above shows the effect. It’s obvious that the entire ocean top layer is now (much) warmer than the deep oceans, and water warmed at the bottom cannot reach the surface anywhere. will happen first at 40N and 40S where the thermocline is least pronounced. Once the now warmer deep ocean water can lose energy to the atmosphere a new balance situation will establish, at (much) higher temperatures than in the present situation. Again all geothermal energy entering the oceans has to escape to the atmosphere at a small area with the lowest surface temperatures. Once the loss there is equal to ALL geothermal energy entering the oceans, the deep ocean temperature will stabilise. In another article https://tallbloke.wordpress.com/2014/03/03/ben-wouters-influence-of-geothermal-heat-on-past-and-present-climate/ I’ve shown that the deep oceans did cool down the last 84 million years with an average rate of 1K every ~5 million years. This means that all geothermal energy entering the deep oceans is also lost again via the atmosphere to space, plus a little more due to the very slow cooling rate. I estimate the area where the deep oceans can cool to the atmosphere is between 5 and 10% of the total surface area. So the geothermal flux of ~100 mW/m2 alone creates an energy flow to the atmosphere of 1 -2 W/m2, mostly around Antarctica. Factors influencing deep ocean temperatures. ad 1) at times with many and large magmatic events the deep oceans are warming up, otherwise they seem to cool down very slowly. ad 2) with more solar energy heating the upper oceans the warm layer will extend more to the N and S, decreasing the cooling area for the deep oceans. ad 3) with the continents concentrated around the geographic poles, the deep oceans have to be warmer to enable them to lose energy to the atmosphere. With the continents concentrated near the equator, the deep oceans can lose energy easily at high latitudes, unless a sea ice layer prevents this. ad 4) undoubtedly more factors will play a role in establishing the temperature of the deep oceans. 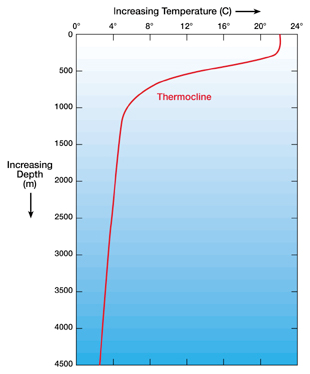 Geothermal heat clearly has a significant bearing on the temperature of the deep ocean. It, however, does NOT have a significant bearing on the ocean SURFACE temperature. You’ve been told why in simple terms several times before, but you simply refuse to listen. 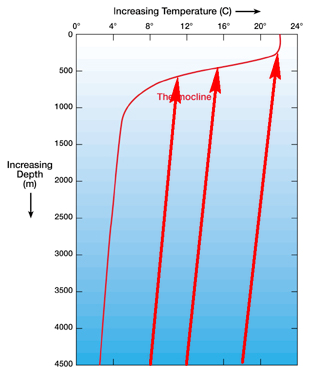 If say the upper ocean warms a bit, making the temperature gradient from the ocean depths to the surface smaller greater, downwards conduction increases. However, precipitation at the Poles will increase, increasing the thermohaline circulation. The thermohaline circulation dominates the planet’s climate in many ways, most importantly the distribution of the Fe trace element needed to accelerate phytoplankton growth and cloud formation. This is a vey subtle yet very stable system, only altered over 10s of 1000s of years. TSI and EUV variation are just as influential. This whole analysis ignores the thermohaline circulation (ie “the global conveyor”). 1) The column of water will not warm @ 1 K / 5000 yr because the bottom is continuously cooled by the cold deep currents. Thus the thermocline can NOT be cleared unless the deep oceans currents are first stopped! 2) It is observed that cool water upwells in a variety of places, including the rather warm Arabian sea. Thus we have experimental evidence that the energy is not delivered only at frigid 3 C areas of the ocean. It’s precisely surfacing bottom waters which bring up heat in the form of less cold. This is the water which has spent time closest to molten rock. A problem is the lack of much real knowledge or data about deep ocean. Temperature is particularly difficult as a consequence of the high pressure, can neither bring up water nor put instruments down there without error. We have poor data on routes or flow stability. Chemistry comes into it too. I doubt there is a lot of effect in general, nature though is surprising. Ben, in a somewhat rare occasion I have to agree with Tim Folkerts, at least with his point number one for sure, my same immediate thoughts. You may need to look into why water at great depths naturally separates and absolutely stratifies into isopycnal (identical density) layer ‘surfaces’ (mathematical surface that is) and all of the oceans move horizontally along these identical density surfaces very precisely (oceanographers words, not mine) except in the more turbulent upper mixing layers or if obstructions and shores get involved. It is the same for atmospheres, no different really except water is nearly incompressible and there cp is then near cv and ‘potential temperature’ and ‘potential density’ still applies as I was explaining on atmospheres in the thread a week or two ago. I have no problem seeing the levels just below 1000 meters being 18°C warmer millions of years ago but that is about as far as I see it, not to the very bottom. See, I took the same potential temperature equations that I’ve used for the last year or so and had the thought a month ago… does this also apply to the oceans? Programming and plotting that thermocline down to the 6000 meters and later again all of the way to the depth of the Marianas Trench and it does as it should and reproduces your temperature/depth curve shown above. But they are not identical, not near the surface, I intentionally left out taking the solar radiation absorbed at the surface into account and that energy influx warps to the warm side that curve near the top surface as you show, near 1000 meters in your case. How you realistically get rid of the 2 to 4°C water at the bottom depending on salinity beats me, it is that same temperature at the bottom of Lake Michigan or at the bottom of the Marianas Trench. Maybe you should do some math to show us the data and equations if what you keep saying is even possible. That sure would help others to see your point. I think the small geo energy flux you mention ends up at the surface in much less that 5000 years, one way or the other. Thinking about this. Do not need the “exit” to be blocked but only for circulation pattern to be such that warm water doesn’t get down, or the cold water that falls to the bottom is trapped. Like the brines that develop in closed basins, even warm brines I don’t know what the salinity profile is, is there a density issue here that complicates the movement of either cold bottom waters? Gail surmises that TSI at high latitudes (above 65N or 65S) can trigger the onset of ice ages. The last seven glaciation cycles show a bi-stable behavior where the average temperature of Earth oscillates between out present toasty (interglacial) temperatures to 10 K cooler with huge accumulations of continental ice. Imo the temperature of the deep oceans is a “balancing act” between the amount of geothermal energy that enters the deep oceans, and how much can escape at high latitudes. In the thought experiment the whole surface is much warmer than the deep oceans, so the deep oceans will warm up. In reality the last 84 million years the deep oceans cooled down, so ALL geothermal energy entering the oceans must have escaped to space. During that time the amount of geothermal energy entering and leaving is at least equal to 60-100 times the TOTAL ocean heat content. Agree. At the same time the slightly warmer water will have a higher buoyancy, and tends to stay near the surface. Below ~200 meter hardly any solar influence is visible in the plots for BATS. In general surface heated water does not sink into the much colder, denser deep oceans. That’s the exact reason why I created two continents at 40N and S in the thought experiment. It shows in all three ocean basins bottom warmed water feeding into the Circumpolar Deep Water circulation around Antarctica. Exactly the place where I assume most geothermal energy is leaving the deep oceans to the atmosphere / space. My feelings as well. We DO know however that in spite of ~60 – 100 times the TOTAL ocean heat content being supplied at the ocean floor, they still cooled down the last 84 million years. To me it is thus clear that the temperature of the deep ocean is completely caused by geothermal energy. This makes it possible for the sun to warm the upper layer of these oceans to the observed surface temperatures => no GHE needed. See my reply to Tim above. I’ve contacted a well known oceanographer and hope he will help me to further develop these ideas. The 5000 years is just the time it takes for 100 mW/m^2 to warm the average ocean colomn 1K, assuming no energy LOSS. Doesn’t say anything about the speed of the currents involved. We need some expert input for that. Has some plots for ao temperature and salinity. If anything, the lowest salinity is in the deep oceans. Imo the Milankovitch cycles (MC) can only have an effect when the deep ocean temperature is below a certain value. 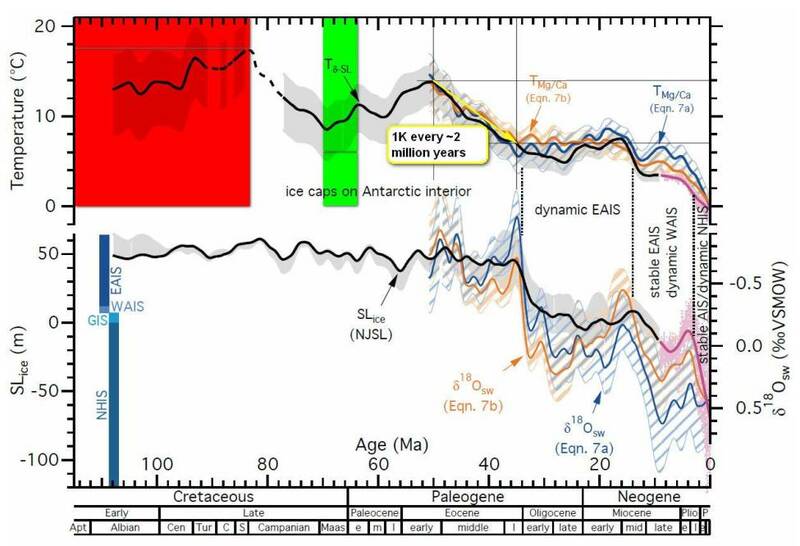 In the Creataceous the MC’s where also active, but we only had “ice caps on Antarctic interior” according to this image. Only with the deep ocean temperature below ~2 – 3 C do we see “stable AIS / dynamic NIHS”. So we have only glacials / interglacials with a low deep ocean temperature. I speculate that during a glacial, the extended surface ice layer may prevent forming of bottom water at high latitudes, and in this way start the warming of the deep oceans by geothermal that ends them again, hopefully before earth enters a Snowball Earth situation. Assuming a balanced situation between geothermal flux and cooling at high latitudes, the large magmatic events in the past are additional, and should create an increasing temperature. The amount of magma I showed is ~10% of the total ocean volume. 1000 / 10 / 4 = 25K during those eruptions. Subtract some for the cooling that normally takes place anyhow (eg 8K), and we have ~17k warming, which is in the same ballpark as the reconstruction shows. Hi Ben. As I’ve said before, I’m not qualified in this discipline. However, I may be able to add to the ‘mechanics’ of the scenario/configuration. The ‘Thermohaline circulation’ relies on ‘temperature and salinity’ for its circulatory influence. However, there must also be an influence from ‘gravity’ (tidal) and ‘Earth rotation’ (Coriolis effect) below the ‘a/o’ (atmosphere/ocean) interface. Just because ‘tidal data’ and ‘Coriolis effect data’ are observed both from and above the a/o interface isn’t to say that these phenomena don’t exist below the a/o interface. They do! Any ‘fluid’ driven by an orb’s rotation shall exhibit a Coriolis effect, and that’s as true for an ‘ocean body’ as it is for an ‘atmospheric body’. Nevertheless, pure water is least dense at ~4C and salinity alters the density of water until it freezes and ejects the salt (this is where I get into problems). However, an ‘enhanced circulation’ that mixes geothermal energy within the ‘deep oceans’ can, I believe, explain the ocean floor anomalies that you express. IOW, the Thermohaline hypothesis is insufficient to account for these activities/properties and IMHO needs modification. This mechanism is part of my explanation why the effect of very large magma eruptions lingers on so long in the deep ocean temperature. The whole ocean floor is slightly warmer than the bottom water, creating an average geothermal flux of 100 mW/m^2. This energy CANNOT escape at the surface due to the solar heated surface layer. Still ALL geothermal energy entering the deep oceans has to escape to the atmosphere/space, otherwise the deep oceans would warm up, however slowly. They have been cooling down the last 84 million years. Looking for the area where the geothermal energy CAN escape to the atmosphere I got to the oceans around Antarctica. My estimate for the amount of energy transfer from ocean to atmosphere is at least 1 W/m^2, and possibly 5 or more W/m^2. This must have an effect on the atmosphere, et voila: lots of extreme low pressure areas around Antarctica. Perfectly fits into my narrative. I’m convinced I have the explanation for our very high temperatures relative to the moon and the large variations on long time scales, but I do need feed back and assistance in working out this whole set of ideas into a complete new base for our climate. It’s actually 240W/m^2. Somewhere in there is your 100milliwatts, mixed in by LOD changes and Lunar driven subsurface tides. Where does the 240 W/m^2 come from? I’m pretty sure that in the polar winter not much sunshine is reaching Antarctica, and still these massive low pressure areas are found around the continent. The 1-5 W/m^2 or more is always on top of all other energy transfers from ocean to atmosphere in the small area I described. Ben, have to agree with TB there, even greater than 240 Wm-1 leaving the oceans to the atmosphere in the tropic days and overall the Earth somewhere around 160 Wm-1. Net LW by ESRL measurements taken at least every hour is usually reading 60-70 Wm-1 net surface to atmosphere and most directly to space, some 100 Wm-1 by evaporation and thermals that carry that latent upward. One question I have is what do you see the mean temperature of the bottom 100 meters of sediment silt at the bottom of all oceans? I have no data, have never seen a figure, but have always thought it must be close to 4 degC, not too warmer than the 2-4 degC salty seawater sitting upon it. I’d guess 4°C at the very bottom and about 7°C one hundred meters further down into the silt. How do you see that temperature difference? I guess I’m asking have you gathered any temperature differentials and thermal conductivity to show how this large warming occurs? And on whether the entire ocean can be warmed by sparse volcanoes I still don’t think that is physically possible. Above such a 1000C magma plume there would be a huge thermal moving that energy directly upward to the surface with layers deep and about the volcanoes would not be affected temperature-wise. Those cold mid layers would all be moving horizontally and radially into that hot upward flux to conserve the mass in the movements, all still stratified except directly above the volcano (well, allowing for current drift). The top layer would be moving large amounts of energy to the atmosphere there and at that spot creating huge thermal carrying that energy to the stratosphere and so on, a continuous conveyor moving that 1000°C to space but of course there would be some thermal mixing in all of these movements. It all depends on where the additional 1-5 W/m^2 concentrated energy flow due to geothermal is surfacing. Around Antarctica it is in winter near sea ice that receives almost no sunshine. Remember just a small uneven warming of the surface is enough to create convection. I’ve no clue. I just use the commonly reported average geothermal flux (GF) for oceanic crust of 100 mW/m^2. The geothermal flux creating low pressure areas IS new afaik. I wouldn’t call at least 136 million km^3 (cubic KILOMETERS) magma ‘sparse volcanoes’. That is roughly 10% of the total ocean volume. This amount of magma does not erupt overnight. The Ontong Java event took ~5 million years for ~100 million km^3. Average 20 km^3 each year. But this is additional to the constant GF and small lava eruptions we can no longer find traces of. If 10% of the oceans volume in magma is not capable to warm the DEEP oceans ~18K, then what IS capable in your view? For any effect that causes warming at or near the surface, we also need an explanation how that heated water can transfer to the bottom of the oceans. Just to be sure, the energy that leaves the oceans in the tropics comes from the solar heated surface layer. Zero geothermal influence here. The energy balance in the tropics is purely solar in vs solar out. Sorry for the slow reaction, had family matters intervening. The water heated by magma spreads out very quickly (couple of hundred meters). Same for hot vents. 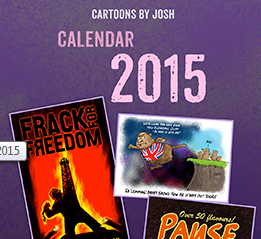 I assume the enormous pressure has something to do with this. With magma erupting in the DEEP oceans no effect will be noticeable at the surface directly above the eruption. The warm surface layer and thermocline make this impossible.